There are currently 208 people online. Jon Peddie Research (JPR), the industry's research and consulting firm for graphics and multimedia, announced estimated graphics chip shipments and suppliers' market share for Q1'12. The news was not good. AMD was able to grow shipments over last quarter by 0.3%, in a down quarter. Intel slipped 1.3% and Nvidia declined 4.5% from the last quarter. Although this did not shape up to be a great quarter for the suppliers, it actually wasn't as bad as it could have been. We found that shipments during the first quarter of 2012 behaved according to past years with regard to seasonality, declining from the previous quarter; however, this quarter's decline (of 0.8%) was less than the ten-year average of 3.1%. If we use graphics as an indicator, the industry seems to be recovering from the floods in Thailand. We have modified our forecast since the last report, and it is less aggressive on both desktops and notebooks - tablets have changed the nature of the PC market. Nonetheless, the CAGR for PC graphics 2011 to 2016 is 9.8%, and we expect the total shipments of graphics chips in 2016 to be 743 million units. Our findings include discrete and integrated graphics (CPU and chipset) for Desktops, Notebooks (and Netbooks), and PC-based commercial (i.e., POS) and industrial/scientific and embedded. This report does not include handhelds (i.e., mobile phones), x86 Servers or ARM-based Tablets (i.e. iPad and Android-based Tablets), Smartbooks, or ARM-based Servers. AMD had a gigantic increase in shipments of its desktop APUs of 84% and a modest 2.6% decline in notebook APUs. This quarter, Intel celebrated its ninth quarter of shipping its Embedded Processor Graphics CPU-EPG, a multi-function design that combines a graphics processor and an x86 CPU in the same package. These devices include the Core i series, and Atom processors in PCs. Intel's desktop EPG shipments had a very strong double digit growth of 18%, and Notebooks showed a more modest 2.1%. Combined with a decrease in overall IGP chipsets shipments, Intel came in for the quarter with a -1.3% drop from Q4. Nvidia shipments dropped 4.5% from last quarter, partially due to the phase out of IGPs. The company will no longer report IGP shipments. Year to year this quarter AMD shipments declined 1.2%, Intel shipped 4.67% more parts, Nvidia slipped -26.3% in the overall market as company withdraws from the integrated segments, and VIA saw their shipments increase by 51% over last year and 148% over last quarter. A little over 123 million graphics chips shipped, down from 124 million units last quarter, and down from 126 million units shipped this quarter a year ago. Discrete GPUs increased 2.7 % from the last quarter but were down 11% from last year for the same quarter. Graphics chips (GPUs) and chips with graphics (IGPs, APUs, and EPGs) are a leading indicator for the PC market. At least one and often two GPUs are present in every PC shipped. It can take the form of a discrete chip, a GPU integrated in the chipset, or embedded in the CPU. The average has grown from 123% in 2001 to almost 133% GPUs per PC. Market shares shifted for the big three, and put pressure on the smaller two, and most showed a decrease in market share as indicated in Table 1. 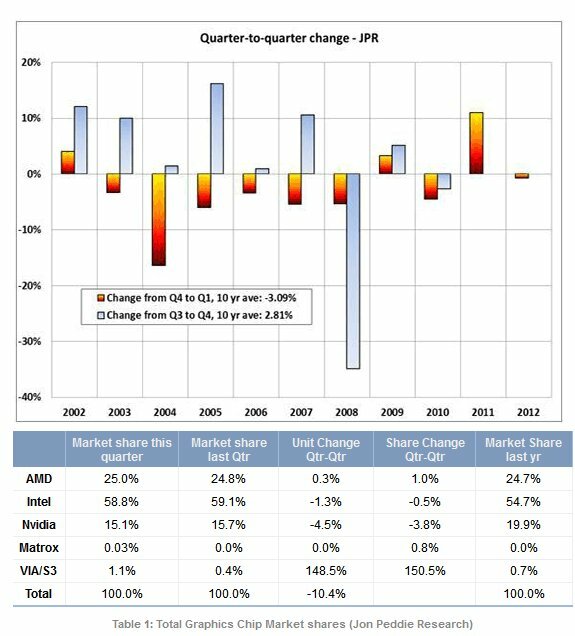 AMD's overall graphics market share increased 0.3% from last quarter due mostly to APU shipments. The company had a 4% increase in shipments of discrete GPUs over last quarter, and an 8% gain in notebook discrete GPUs. Intel continues to be the overall market share leader, elevated by Core i5 EPG CPUs, Sandy Bridge, and Pineview Atom sales for Netbooks. AMD gained market share quarter-to quarter Intel and Nvidia lost share. Nvidia has exited the integrated graphics chipset segments and it is shifting its focus to discrete GPUs. The company suffered a desktop discrete market share loss (4.3% quarter-to-quarter), and had a 5% gain in notebook discrete GPUs. Nvidia credits strong connect with new Intel Sandy Bridge notebooks for its gains. Year to year for the quarter the market decreased. Shipments decreased to 123 million units, down 3.3 million units from this quarter last year.